I don’t consider myself a hands on person, but I am capable within certain limitations. I’ve learned over the years that when things break, paying a professional to fix it is only worth it sometimes. In almost all cases, repair technicians will charge you a fee just to look at the problem and apply the “assessment” fee to the actual repair should you move forward. Depending on the value of the item that has broken, it may or may not even make sense to bring it in for a look see. Fees will vary depending on what the item is, so you need to make a judgement call as to if it is even worth the trouble and expense. What is the value of the broken item? Do you use it often or is this something you can live without for awhile? How much is it for a new/replacement item? Can you wait for the repair to happen or are you in a rush? Can you afford the expense of a repair or new item? What are you going to do with the old one? What are your chances of fixing it given the above? I recently ran into some minor issues and managed to find excellent solutions on YouTube! A friend of mine had their AC power outlet on an older computer “cave in” from the outside case. I watched him try to open it up from the bottom and was concerned as it looked like he was going to break it trying to get it open. I quickly searched YouTube for the make and model and found a nice short video on how to open it. Apparently there were some “hidden” screws we had to deal with. We opened those and he was able to promptly get back into business! No technician needed, no new purchase required and he was able to get back to work! My son had a similar problem on his Macbook. The machine was shut down and was not able to be booted based on a hardware issue. The device was also out of warranty and he needed it for school. Going to Apple for a repair is time consuming and expensive, so I quickly searched for solutions on the web that suggested the battery needed to be disconnected then reconnected. A quick Youtube helped direct us on how to do that and we were back in business! I recently had a flat tire and was in the process of replacing it with a spare. However, the tire was stuck and would not come off. Instead of calling for a tow truck (easily $80), I searched Youtube and quickly learned that a good swift kick done a certain way to the right place could solve the problem, and it did! Saved me money and time! 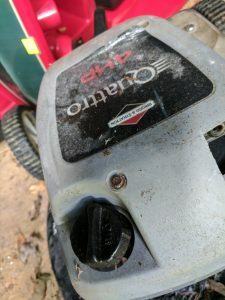 As the spring has triggered our lawn to grow, the starter string on my lawn mower decided to break! A quick YouTube showed me how I could replace that and get going again. This one took a little longer as I need to fetch parts and some tools, but I’m back in business. If we went my wife’s route, we would have gotten a new lawn mower. My decision cost $4. The internet can be a powerful aid in many situations. However, not everything can be fixed. When dealing with electronics or other items not worth fixing, you don’t want to make things worse. Also, many people out there call themselves technicians but are really “hacks”. We often see poor repairs done from so called “professionals” that charge people money for their “hacks” who make the problems worse. We’ve established a qualified repair infrastructure to help you avoid those situations. We also offer great protection packages on things you may buy in case you can’t fix it, or don’t have the inclination to do so or are just too complex or valuable to try. Remember either way, things break and you have options!